This is an exciting development for General Aviation that combines a computer, GPS, and camera data, to create memorable souvenirs for passengers. The system started development after purchasing a Garmin 90 GPS at the 1997 Florida Sun'n Fun and integrates equipment commonly used by Pilots. 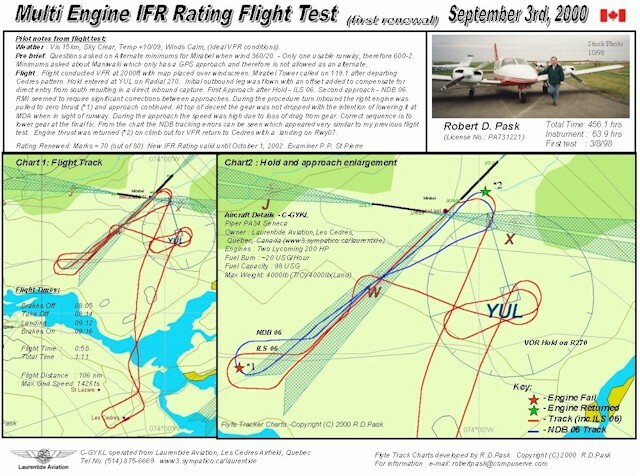 Between 1997 and today many charts have been produced for passenger souvenirs and also to record Robert's multi engine and instrument rating training flights at Laurentide Aviation, Les Cedres, Quebec. The system was successfully used during Air Canada's Lockheed 10A, CF-TCC, visit to Laurentide Aviation on June 3rd 2000 as part of the Dreams Take Flight charity. During the day CF-TCC piloted by Al MacLeod and Harvey Reid carried 36 passengers on 4 flights around Montreal. In total around 40 mouse pads were made from charts created by the Flyte Track system. In 1997 producing the charts would take many hours using multiple expensive applications and this has been reduced to approximately 10 minutes using specialised software along with other inexpensive packages. The goal for eventual release of the system is 5 minutes. The Flyte Track system being developed will allow flying clubs to market their operation by providing memorable souvenirs for customers on flight training courses or simply taking a sight seeing tour. Example charts are being added to this site in the course of time.